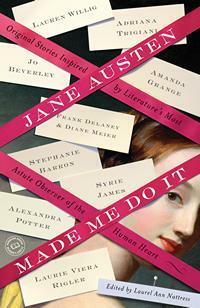 As it’s Jane Austen’s birthday, December 16th, and also the season of giving, I wanted to spotlight an absolutely delightful collection of Austen-inspired short stories, Jane Austen Made Me Do It, edited by Laurel Ann Nattress. Part of the problem is that these knock-offs only make me pine for authentic Jane even more. But now, Janeites take note—the drought is over! A wonderful collection of short stories has done the unimaginable, the unthinkable. Austen’s beloved characters have come to life again in an enchanting series of vignettes, many of which are backstories or codas to our favorite novels. Well before Persuasion, Captain Wentworth earns his stripes as a Midshipman in the Royal Navy. We learn how Mr. Bennett landed himself his “very silly wife.” The now married Elizabeth and Fitzwilliam Darcy prepare for Georgiana’s ‘Coming Out’ ball. And, things get complicated when Mr. Knightley moves in with Emma and her father. Teensy spoiler alert: this story also offers happy news for poor Miss Bates. I loved getting another glimpse at these characters. It’s almost like the bonus deleted scenes you get with a dvd. Jane Austen herself makes a few cameos, finishing up her Mansfield Park manuscript, and also acting as a sort of deus ex machina for star-crossed lovers in a very Austenesque Christmas tale. A few of the stories take place in modern times, including a clever ghost-busting romp in Northanger Abbey. The only glitch is that current owner, Mr. Tilney-Tilney, comes off sounding a bit more like Thurston Howell the Third than a British gentleman. Still, it’s a fun little parody, much in the vein of the original and complete with papers appearing and disappearing in the very chest that so vexed Catherine Morland. Indeed, most of the stories have similar sly ‘easter egg’ allusions for Janeites to uncover. While, no one else can write like Jane Austen, these stories come close and they certainly capture her spirit. The collection reads almost like the literary equivalent to a tribute album. Janeites will certainly delight in and savor Jane Austen Made Me Do It. A perfect Christmas gift. I usually pass books along, but this one is a keeper.